New'AT&T AdWorks' unveils new brand and offerings focused on connecting advertisers with audiences across online, mobile and TV platforms. Return on Insights - exactly what AT& T AdWorks provides. ATT Adworks use aggregate subscriber data you can't get anywhere else to help you reach your audiences across mobile, online, and television. AT&T AdWorks expert groups and target audiences based on demographic and contextual factors as well as online behavioral patterns to help you find your audiences and connect with them online. .
AT&T AdWorks uses audience targeting, by analyzing viewing behavior from millions of TV set-top boxes, to help advertisers reach the highest concentration of their desired audience. 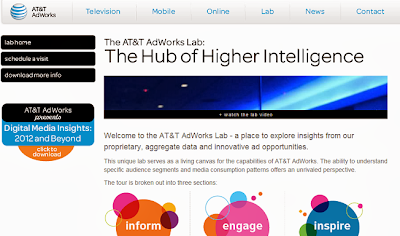 AT&T AdWorks is the ONLY source for targeting based on quality aggregate AT&T subscriber data and insights. We effectively overlay our proprietary aggregate data from 100 million subscribers on our mobile network to help you better reach your audiences.